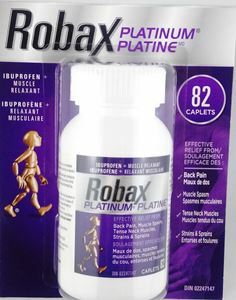 Robax Platinum ,Robax Platinum Blister Pack for effective relief of different kinds of back pain! Robax Platinum Blister Pack for effective relief of different kinds of back pain! Robax Platinum provides relief from different kinds of back pain due to muscle spasm, sprains, strains and neck muscle pain. It contains Ibuprofen which is an analgesic to releive the pain and Methocarbamol which is a muscle relaxant for relaxing tense muscles. Medical ingredients include Methocarbamol 500 mg, Ibuprofen 200 mg. Non Medicinal Ingredients include Colloidal silicon dioxide, copovidone, FD&C Blue No. 2, ferric oxide (red), hypromellose, methylcellulose, microcrystalline cellulose, polyethylene glycol, sodium starch glycolate, stearic acid. For adults and children aged 12 years and older, recommended dosage is 1 to 2 caplets every 4 to 6 hours. Maximum dosage should not exceed 6 caplets in 1 day. Robax Platinum should not be mixed with other analgesics or acetylsalicylic acid (ASA). People suffering from hypertension, peptic ulcers, heart, kidney and liver problems, pregnant women and lactating mothers should not take this medicine without the doctor's recommendation. If you experience any heartburn, pain in the stomach, diarrhea, constipation, rash, vomiting, nausea or any other unnatural or unexplained symptom, then a physician should be immediately consulted. Robax Platinum may cause dizziness hence any activity that requires mental alertness should be avoided after taking this mediicine. Alcohol and other alcoholic drinks should be avoided. Product should be stored at room temperature and away from direct sunlight.